Can the Farm Bill Help Small Farms? Learn about one Congresswoman's plan to strengthen small farms, promote farmers' markets and help school lunch programs buy more food locally. 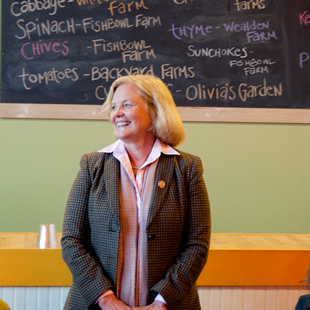 Chellie Pingree (D-ME) is not only a seasoned two-term Congresswoman, she’s also a lifelong small-scale farmer. She has 200 acres on the windswept hills of Maine’s coast that provide organic milk, vegetables, chickens and goat cheese to Nebo Lodge, which Pingree co-owns, as well as to local schools and markets. So she was a natural for us to interview about the Food, Conservation, and Energy Act of 2008, which expires on September 30. The so-called “farm bill” outlines federal spending for everything from subsidies for corn and soybeans to food stamps and nutritional programs, costing taxpayers $56.8 billion per year. Her Local Farms, Food, and Jobs Act attempts to tweak the law with a package of reforms intended to foster a new generation of wholesome food. What are some of the biggest problems with the current farm bill? all the big subsidies, over $10 billion per year. But people really want to invest our tax dollars differently...They want healthier, locally grown food. The consumer demand is really high. What other parts of the farm bill would you like to improve? Helping to promote farmers’ markets and making it easier for people to use food stamps there. Helping school lunch programs buy more food locally. Increasing value-added producer grants for, say, putting in a certified creamery so farmers can make their own cheese and sell it at the farmers’ market. You’ve just enhanced income and produced a new product; maybe you employ another person on your farm. These things sound little, but when added up I think they equal like 10,000 potential jobs. Are you hopeful that your provisions will be included in the final bill? We’re a long ways from the end, but we’re feeling positive. There’s a revolution out there, people of all economic brackets, all ages, are really engaged in where their food comes from, in a way you wouldn’t have seen five years ago.